Rockstar Energy Suzuki’s Kevin Strijbos was an attacking force of speed and eagerness at a busy Uddevalla circuit for the Grand Prix of Sweden, where the Belgian finished third overall on his works RM-Z450 and grasped his fifth trophy of the season today. Some 21,000 spectators clambered up the neighbouring rocky hillside and around some of the newly-revised layout for this 12th round of 17 in the FIM Motocross World Championship. Warm temperatures and bright skies were the order of the day as the Rockstar Energy Suzuki World MXGP team tackled another narrow course and slick terrain. While Strijbos was almost in contention for his first victory in seven years, team-mate Clement Desalle was fortunate to escape from a fast first-corner pile-up in the second moto without serious injury. Despite the restrictive nature of the size of location and the stony, loose dirt that either creates deeply rutty corners or produces flat and slippery turns, Suzuki was able to excel on a track that was ultimately difficult to judge. Positive starts were essential and this was another area in which the race-spec RM-Z450s were particularly strong: On Saturday both Desalle and Strijbos set the pace in qualification; going 1-2 in the final order with Desalle earning his second pole position of the year and Strijbos hinting at his potential with the fastest-lap of the day. On Sunday those two premium positions in the gate were immensely useful. Desalle escaped into second spot behind Cairoli but could do little to reign in the champion. Strijbos was not far behind and had to use some brave lines and moves to pass Steven Frossard, Jeremy Van Horebeek and then his team-mate to slot into second place. He then started to shrink the gap to Cairoli but ran out of laps to apply pressure to the leader. His runner-up position however teed up the second moto nicely while Desalle was frustrated by fourth spot and was keen for better. The latter’s weekend was over in the opening seconds of the race. Strijbos was pushed across the front section of the pack approaching the first corner and came together with Desalle. The German Grand Prix winner had nowhere to escape and crashed in the worse possible place; in the midst of a speeding pack. He was hit by two other racers but after some medical attention on his back was able to walk gingerly to the medical centre. The Suzuki star underwent scans that initially revealed no serious internal damage but Desalle was in a lot of pain Sunday afternoon and evening. It is possible that he will have more medical checks in the coming days. Strijbos suffered a problem with his goggles that left him with reduced visibility and although he tried valiantly to pass Max Nagl for third position he had to accept fourth place by the chequered flag. As the circuit emptied on Sunday afternoon the costs and gains of the Grand Prix of Sweden were already being assessed. Desalle surrenders second place in the championship standings to Van Horebeek and his first DNF of the season means the gap to Cairoli at the top of the MXGP table lies at 57 points while Strijbos is still alone in fourth and 80 points behind his team-mate. 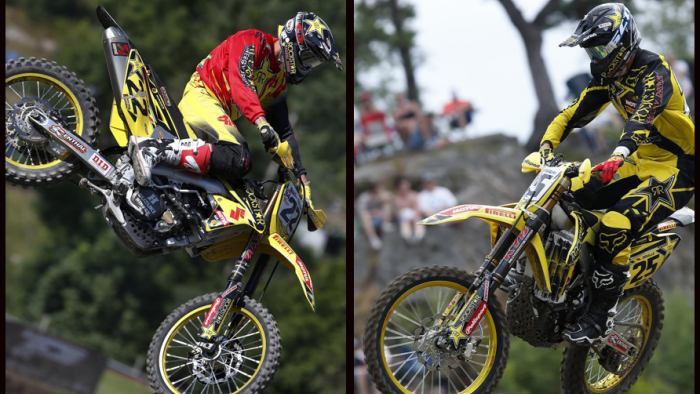 The Grand Prix of Finland at Hyvinkaa will represent round 13 of the series next weekend and will see Rockstar Energy Suzuki World MXGP returning to the circuit where both Desalle and Strijbos lifted trophies in 2013.